The U.N. cited renewed growth in the developing world and a drop in food prices for the decline in chronic hunger. 925 million people will still go hungry, according to U.N.
(CNN) -- The good news is that improving economies in developing nations is allowing more people to eat better, but the United Nations estimates that nearly 1 billion people will still face chronic hunger this year. The Food and Agriculture Organization and the World Food Programme estimated that 925 million people, almost three times the population of the United States, will go hungry. That's down from 1.023 billion people in 2009 and the first decrease in 15 years. "But with a child dying every six seconds because of undernourishment related problems, hunger remains the world's largest tragedy and scandal," said FAO Director-General Jacques Diouf in a statement. "This is absolutely unacceptable." More than 40 percent of the hungry live in the two largest nations, India and China. Only 19 million of the world's undernourished live in developed countries. The United Nations attributed the lower number to renewed economic growth expected this year, particularly in developing nations, coupled with a drop in food prices since mid-2008. 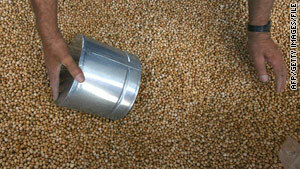 However, recent spikes in food costs could hamper a further reduction of hunger, the FAO warned. • Two thirds of undernourished people live in just seven countries -- India, Pakistan, Bangladesh, Indonesia, China, the Democratic Republic of Congo and Ethiopia. • The region with the most undernourished people continues to be Asia and the Pacific, with 578 million. • But the proportion of undernourished people remains highest in sub-Saharan Africa -- at 30 percent in 2010, or 239 million.